The Secret Garden of Maths » GeoGebra: The Ultimate Projectiles Applet! Home > GeoGebra	> GeoGebra: The Ultimate Projectiles Applet! 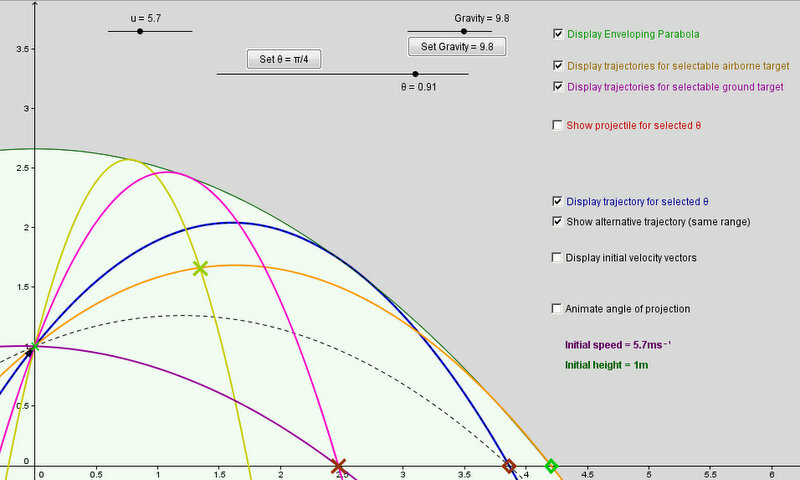 GeoGebra: The Ultimate Projectiles Applet! User-friendly applet designed with perfection and aesthetics in mind. Play with the checkboxes and X points. Those with a grounding in projectile mechanics will find it is self-explanatory. You can select: angle of elevation OR range OR an airborne target, for any speed of projection and strength of gravity. The applet shows the possible trajectories under the given constraints. The applet also animates balls projected at the selected angle of elevation.